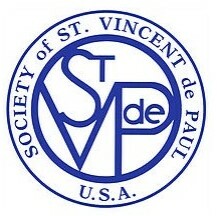 Inspired by Gospel values, the Society of St. Vincent de Paul, a Catholic lay organization, leads women and men to join together to grow spiritually by offering person-to-person service to the needy and suffering in the tradition of its founder, Blessed Frederic Ozanam, and Patron, St. Vincent de Paul. As a reflection of the whole family of God, members, who are known as Vincentians, are drawn from every ethnic and cultural background, age group, and economic level. Vincentians are united in charity world-wide, through their spirit of poverty, humility, and sharing. Vincentians are nourished by prayer and reflection, mutually supportive gatherings, and adherence to a basic Rule. Organized locally, Vincentians witness God’s love by embracing all works of charity and justice. The Society collaborates with other people of good will, to provide assistance for basic living needs in our community. Vincentians make no distinction in those who are served. Vincentians strive to see the face of Christ in everyone they meet. Lord Jesus, you who willed to become poor, give us eyes and a heart directed toward the poor; help us recognize you in them — in their thirst, their hunger, their loneliness, and their misfortune. Enkindle within our Vincentian Family unity, simplicity , humility, and the fire of love that burned in St. Vincent de Paul. Strengthen us, so that faithful to the practice of these virtues, we may contemplate you and serve you in the person of the poor, and may one day be united with you and them in your kingdom. Those in need may call 402-HELP YOU (435-7968), and speak to one of our St. Gabriel Call Center staff or volunteers. We take calls Mondays, Tuesdays, Thursdays, and Fridays from 10:00 AM to Noon and on Wednesday from 5:30 PM to 7:30 PM.